Shade Screens: Fiberglass or metal shade screens are often cost effective and are capable of reducing solar heat gain up to 80% compared to unshaded clear glass! Change Your Thermostat Setting: Save 5% to 10% for every two degrees warmer in the summer and two degrees cooler in the winter! A programmable thermostat can really come in handy. Have you seen the new thermostat that connects wirelessly over your home network? 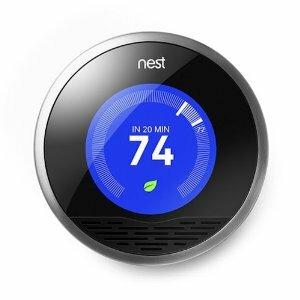 The Nest Learning Thermostat can be controlled from your smart phone or online. It is quite an investment up front at $249, but it claims to save you $6,000 over your cooling system’s life span. Find it online at Amazon.com and other home improvement retailers. Electronic Devices: Did you know that many of your home electronic devices still use power when they are turned off? They can use as much as 75% of their ‘on’ use when off. When practical, devices like DVD players, computers and stereos should have their power source disconnected when not in use.